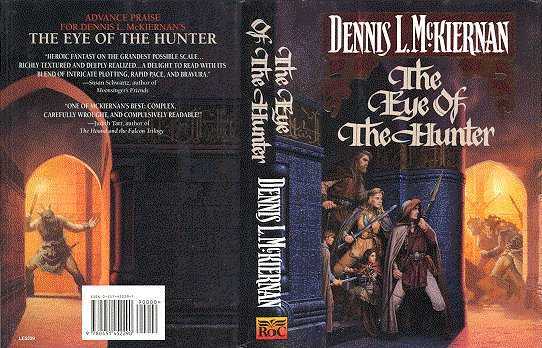 Foreword to "The Eye of the Hunter"
At times I've been asked, "Where do you think legends come from? Was there ever a time that the tales were true . . . each perhaps in a simpler form, before some tale teller's imagination embellished it beyond recognition?" Along with those questions come corollary probes: "Do you think there were ever Elves, Dwarves, Wee Folk, others? If so, what happened to them? Where are they now? Why did they go? Did iron drive them out?" I am a tale teller, perhaps guilty of embellishing tales beyond all recognition . . . but then again, perhaps not. Perhaps instead I am working on a primal level, unconsciously tapping the ancestral memory embedded in my Irish genes. Mayhap in the telling, or in the dead of the night, ancient fragments bubble up, knocking on my frontal lobes for admittance, or slipping over the walls of disbelief like heroes in the darkness coming to rescue a consciousness entrapped within humdrummery. If it is ancestral memory, then mayhap there once were Elves, Dwarves, Wee Folk, others. Mayhap they did live on earth . . . or under . . . or in the air above or the ocean below. If so, where are they now? Integrated? Separated? Hidden? Extinct? I would hope that they are merely hidden, at times seen flitting at the corner of the eye. Yet deep in my heart I fear they are gone. Where? I know not. There have been times when surely I have glimpsed what my ancestral memory has safely locked away, visions which come in the depths of the darktide when the sleeper sleeps and the walls are less patrolled. Mayhap these are the fragments which help shape the tale in the telling, glances of the visions seen in the fathoms of the night. Come, let us together explore the latest ancestral fragment, this midnight stormer of the bastion, for embedded within The Eye of the Hunter we may find answers to our questions, can we just riddle them free.